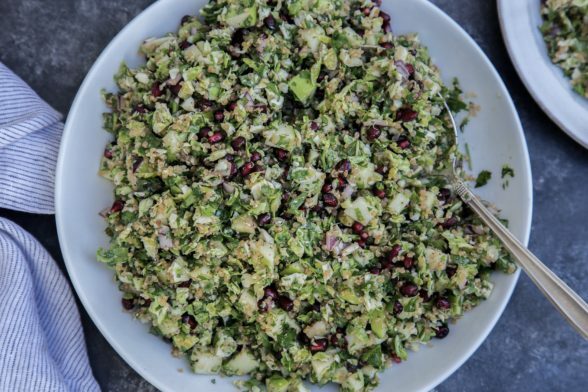 This is the ultimate fall/winter chopped salad! I am obsessed with chopped salads, as you know. I love not working too hard to eat my food and getting multiple flavors and textures in every bite. And if you break out your food processor, this is a snap to prepare. So what is this, exactly? It’s not tabbouleh of course, because that is a parsley salad with a little bulgur, tomato, mint and cucumber. It’s a summer staple for me, although I make it with quinoa instead of bulgur. You can find that recipe here. 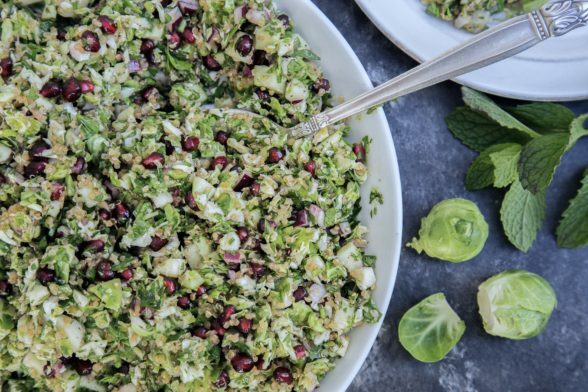 So all I did was make a few seasonal swaps here – green apple instead of cucumber, pomegranate instead of tomato, and then I used minced Brussels sprouts instead of most (not all) of the parsley. 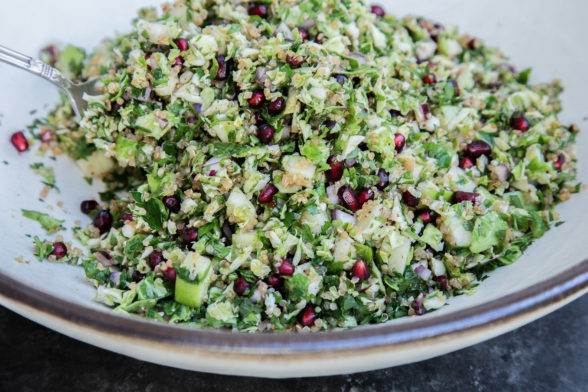 I kept the mint and lemon-based dressing and I swear it still tastes like a classic tabbouleh. There’s so much nutrition packed it this bowl, which will please vegans and Paleo-followers alike. Plus you can serve this salad with practically any meal. I taught this recipe in my October cooking classes and many of my students made this for Thanksgiving. But it’s really easy enough to make for any weeknight meal, as well. Almost everything can be done in advance (except the apple) and assembled at the last minute. “Assemble” is my favorite word for holiday dinners! For a quick review on how to use your food processor, watch my YouTube video here. Rinse quinoa in a bowl with water or place quinoa in a fine mesh sieve and rinse under cold water until water runs clear. Transfer to a small saucepan and add ½ cup water. Bring to a boil and simmer until water is absorbed, about 15 minutes. Turn off the heat and allow to sit covered for 10 minutes. Transfer quinoa to a serving bowl and allow to cool. Fluff with a fork periodically. Combine cooled quinoa and remaining ingredients. Toss to mix well. Taste for seasoning. *Or skip Step 1 and use ¾ cup cooked quinoa. Made this for Christmas dinner. Everyone loved it! I’ll be making it again soon. Thank you so much! Terrific! I’m so happy to hear that! I made this for 13 on Christmas Eve and again for Christmas Day. It is delicious! Then I combined the leftovers with your Christmas Wild Rice salad and yum again. Thank you! Wow! Good idea to combine the two! Just wanted to take a moment and thank you again for your fantastic website, for your insights, for your recommendations and your delicious recipes and meal planners. I have been religiously consulting your website since I first discovered it about 3 years ago. I wish you a wonderful holiday season and may the new year bring us much peace, joy and health! I hope you have time to relax a bit!